Surprises can be pleasant or disrupting. But rarely are they roadblocks. The apparent victory four years earlier that slipped away? 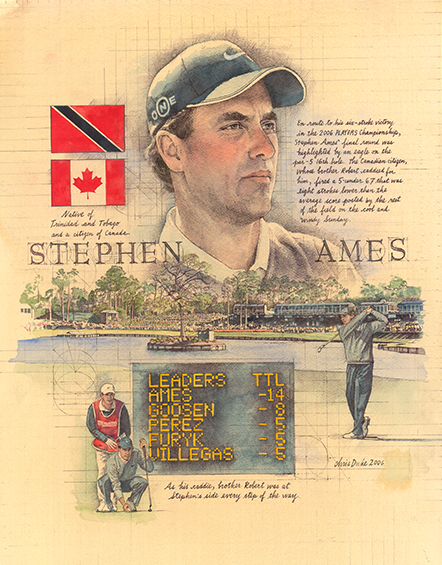 It hardly dulled Stephen Ames’ enthusiasm for THE PLAYERS Championship. So, he didn’t win in 2002. No worries. He had another shot in 2006 and this time he came through with authority. “This is big. I beat the top players in the world,” said the 41-year-old Ames, who made sure there was no repeat of 2002 when someone else controlled the outcome. That year, Ames was finished at 6-under and thought he had it won because only Craig Perks was in position to beat him and Perks was one behind and spraying it. Improbable as it was, Perks went eagle, birdie, par with two chip-ins and a long putt to beat Ames by two. What the Canadian learned that day was this: Be the one to set the agenda, and he did that in the final round in 2006. A double bogey at the par-4 10th cut his lead to two, but Ames asserted himself — birdies at 11, 13, 15, and an eagle at 16. His third back-nine 33 of the week gave him the best score of the day, a 5-under 67, and at 14-under 274 he whipped Retief Goosen (69) by six in the 25th go-round for the championship at THE PLAYERS Stadium Course at TPC Sawgrass. “I did that this week, put myself in another gear,” said Ames, who was at his best when it mattered most.